Most Australians up until the 1950'S had an Irish connection or two. Our Irish connection fell mainly on the matrilineal side of the family. Many of the Irish came to Australia during the 'potato' famine. In the late 19th Century about a third of the Australian population had an Irish connection. The Irish influence in Australia permeates the Australian culture at many different levels. The Stone family Irish ancestry is through a direct matrilineal line of 2nd great grandparents Michael and Mary Devine (nee Hassett) both from Clarecastle Ballyea County Clare. 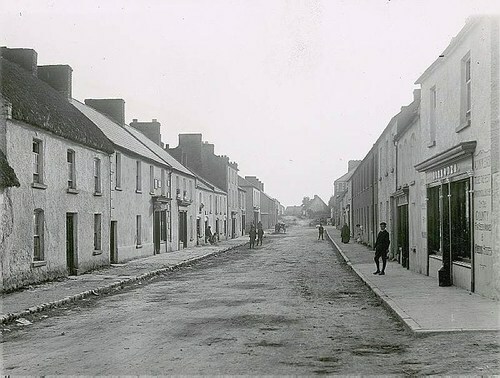 The main street of Clarecastle at the turn of the last century circa early 1900's. Courtesy of Eric Shaw. They married in Geelong before moving onto Ballarat. Many Irish found their way to Australia attracted by the gold fields from Victoria to West Australia. Others found a niche in running pubs and pastoral leases. They included a 2nd matrilineal great grandfather Thomas O’Gorman from County Limerick; a matrilineal 2nd great grandmother Annie Schofield (nee McDermott) from County Roscommon Dublin and a matrilineal 3rd great grandmother Ellen Augustine Bilston (nee McElliott) from Listowel County Kerry. Their activities were largely concentrated in the western district of Victoria. The Bilston family were famous pioneers and 3rd great grandfather George Yarra Bilston was one of the first European children born 1838 in Port Phillip District (later Victoria) Kangaroo Station Arthurs Creek Yarra Yarra. He later moved to Katanning in West Australia. Other Irish connections include patrilineal great grandparents James and Catherine Currie (nee McArthur). James was born in Lanarkshire Glasgow and Catherine Belfast Ireland. The Currie line (spelt in one document Cerry and another Kerry) appears to have originated in Ireland where James father Thomas was born. Glasgow was home to a large expatriate Irish population over generations many of whom found their way to Australia. There is a convict of note Dennis McCarty (also ‘McCarthy’), an Irish rebel who married 5th great aunt Mary Anne Wainwright. He is included in the Australian Dictionary of Biography Volume 2 among some of Australia’s leading men and women. A convicted farmer from Wexford in Ireland, he arrived in Sydney in 1800 on the Friendship. He was one of the many Irish Rebels transported at that time.